It has been a little while since my last cookware update so I thought I would put a little something together about my most recent advances in my search for non-reactive cookware and a healthy kitchen. If you missed them check out my past posts on the topic Concerns About Cookware and Cookware Update: SafePan Review. I have been using my SafePan several times a week for a couple of months now and it still performs beautifully. There are no signs of scratching or chipping and the ceramic coating is in great shape. It still works like a non stick dream. Every time I use it I am sure to rub the surface with a paper towel and some oil to keep it nice and slick and it seems to be doing the trick. Several weeks ago I purchased a 2.2 quart sauce pot from healthy legend. The ceramic coating has a very similar feel to the safepan but the interior is a grey ceramic instead of black. It is easy to cook with and easy to clean. The one pot is working just fine for us for now but at some point I will probably pick up one more in this size and maybe one of the larger 7.1 quart pan for bigger jobs. Note: Sadly, it looks like the SafePan is not currently available from Amazon. Healthy Legend does make a similar pan and based on my experience with my Healthy Legend pot I think this would be a very good choice. Beyond cookware, the next front in my healthy kitchen quest is non reactive food storage containers. 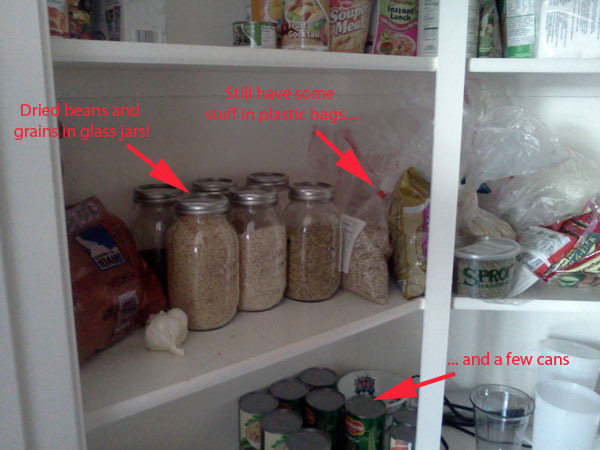 I have always used whatever cheep Tupperware type stuff we had on hand for food storage. 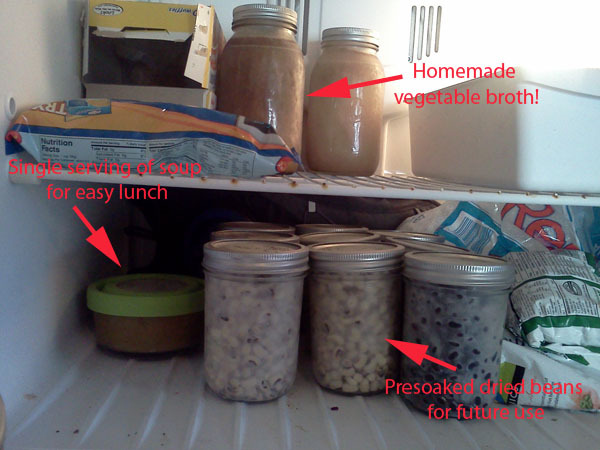 I have even been known to freeze or microwave leftovers in those disposable storage containers. Yuck. It kind of grosses me out now to think about that plastic reacting to those extreme temperature changes with my food in it. I found these Anchor Hocking glass storage containers and love them! They come in perfect sizes for a single serving soups and chili's to freeze for lunches. They also make baking pans with the same lids and I love the idea of making and having previously prepared frozen casseroles on hand for easy dinners (although I haven't tried this yet). I have been picking up one or two every time I am at the store so I don’t break the bank all at once. Slowly but surely I am going to replace all my plastic storage containers with glass. I have also started using simple glass jars for storing dried goods instead of keeping them in the plastic bags they come in. I still need to pick up a few more in different sizes to finish up that job. Its an easy switch, it is less reactive for my food and it makes my pantry look pretty. Bonus! Around the same time I was doing all that research about cookware I came across some information about canned goods that made me start to think twice about those choices as well. Those cans are lined with plastic so that the metals don’t leach into the food. They leach BPA instead. Great. I have always used lots of canned beans for chili's and other meals and lots of canned tomatoes. After learning about how canned foods can react with the foods (especially acidic foods like tomatoes) I am determined to replace these food sources if I can help it. The beans are fairly easy to deal with. I just buy dried beans instead. They are easy to cook with, you just have to plan ahead a bit. When I know I am making chili tomorrow for dinner I just measure out my beans the night before and set them out to soak so they are ready to go in the crockpot in the morning. Easy as pie. You can also freeze presoaked beans to have on hand if you want. The last time I made a recipe with beans I just soaked the whole bag instead of only what I needed and froze the rest. I just have to run a bit of hot water over them to loosen them up and they are ready to throw in the crockpot. Next up is tomatoes. I am working on finding a source for me to buy local farm grown tomatoes in bulk. It’s the season for it so I know they are out there somewhere. When I find them, I am going to try my hand and canning (I guess jarring is really more accurate word for it since I will be using glass jars, not cans... that's kind of the point). Wish me luck! I’ll keep you updated on how that goes. If you are interested in purchasing any of the products in this post please consider supporting this blog by using the affiliate links in this post to purchase from Amazon. This is very inspiring! I've been meaning to switch to glass containers, but I haven't yet. I really like the idea of buying a little at a time. I didn't know about the BPA in beans--yikes! I canned stuff for the first time last fall--it was a lot of fun, and we're still enjoying our harvest! I was able to find a "starter" canning kit at the grocery store at a reasonable price that made it pretty easy.